This is a complete 3" front and rear suspension lift for your Frontier. Adjustable from 0-2.5” of lift height. We recommend them to be run from 0-2” for best shock travel. Outfitted with Eibach Springs, the best name in springs. Available in 50 lb. increments from 500lb to 700lb to suit your vehicles aftermarket weight needs. Fully assembled and ready to bolt-on with T-6 aluminum anodized top mounts. Comes with a spanner wrench for adjusting lift height. 100% Made in the U.S.A.! -550 lb. 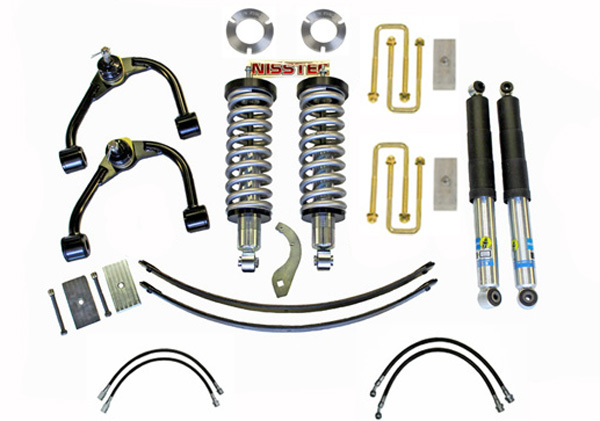 springs- All stock weight 4x4 Xterra’s and Frontier’s. Good for 2wd models with skids, sliders, and tube bumpers. Please Call If You Are Unsure What Spring Rate To Select. - (2) Radflo Emulsion 2.0" or 2.5" Remote Res rear shocks. If your vehicle does not have adjustable cam bolts installed, you WILL NEED THEM!! Nissan only installed adjustable cam bolts in some 2005 year Froniters. Cam Bolts allow +/- 2 degrees camber/caster adjustment and are a must with this kit for proper alignment!! Copyright Xterra Performance. All Rights Reserved. eCommerce Software by 3dcart.